Swifts are aerial birds, meaning that they spend much of their lives in the air. Birds eat, drink, mate, and are believed to sleep while flying. Swifts are powerful flyers because they have strong breast muscles and long wings that are large and narrow. Their legs and feet are so small that they cannot walk. When swifts are on the ground, they are unable to quickly take off and fly. As a result, swifts land on tall trees or structures like chimneys. Swifts cling to surfaces by using their four strong toes on each foot. The head to-tail length of swifts ranges from 3.4 to 9.6 inches (9 to 25 centimeters), and they can weigh from 0.2 to 7.6 ounces (5 to 205 grams). Most birds have black feathers, with some brown and blue coloration. Some birds have white rumps, chests, and bellies. 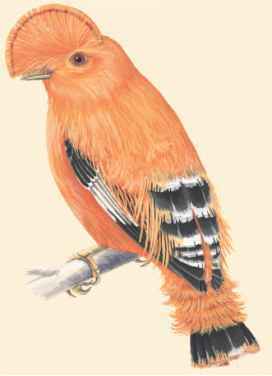 Male and female birds have similar plumage (feathers). The swift has a narrow body and a large head with large eyes. The bird has a short bill and a large gape, which is the width of the open mouth. The gape, being as large as the swift's head, allows it to catch and swallow insects while flying. The word "swift" means fast, and swifts can fly at a speed of more than 100 miles (160 kilometers) per hour!